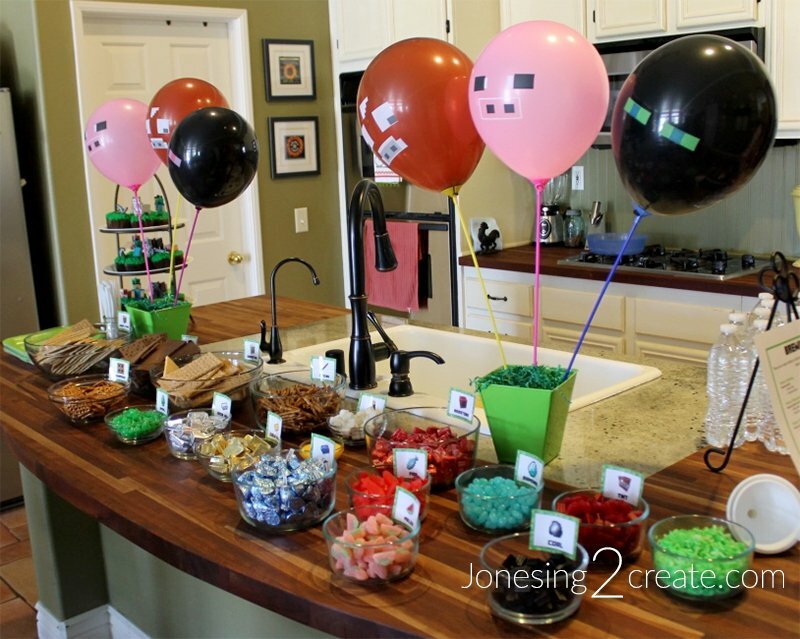 My boy is a huge fan of Minecraft, so I figured it was finally time to throw him a Minecraft birthday party. This summer has been a busy one, so I had to pick very carefully what I was and was not going to do. And even then I had to cut a few things from the party last minute. Luckily, it was mostly decoration stuff and boys really don’t care about that anyway. It is funny the stuff that we obsess over as moms, when most of the time the kids couldn’t care less. 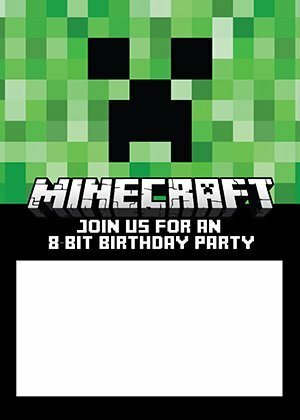 I know absolutely NOTHING about Minecraft and would rather gouge my eyes out than play video games, so this party was a bit of a stretch for me. I had to take a crash course in Minecraft and rely heavily on the expertise of my boy. He was very particular about everything being authentic, so I was in good hands. Digitalmomblog.com came to the rescue on this one, and I used her invite. They are free and she is fabulous! I didn’t have time to make my own, so I was so grateful that she was willing to share her talents! I did find some time to do a few printables, and the door sign was one of them. I hate having to answer the door for birthday parties, so a sign is always a must. 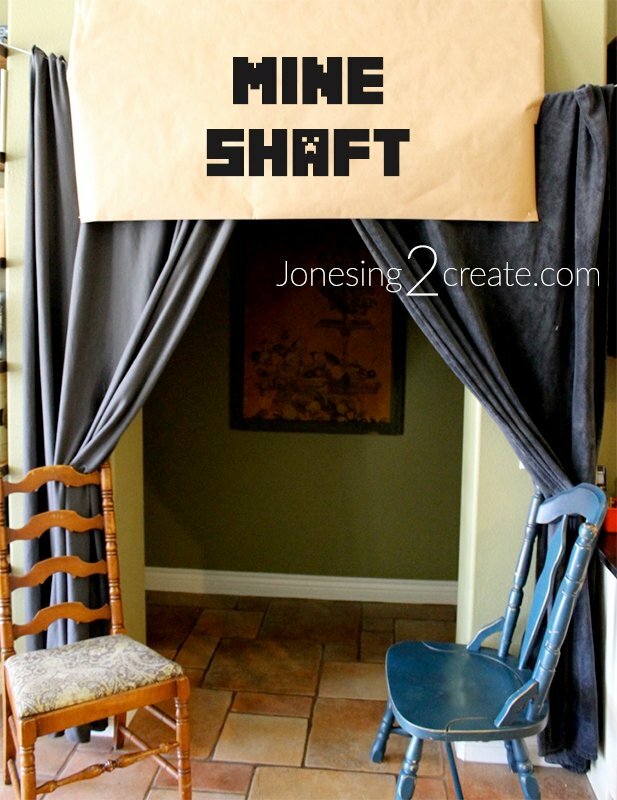 I was going to do a creeper door with a plastic green table cloth and even had all the pieces ready for it, but then I ran out of time to hang the thing before the party. Boo. But I did find time to do a nether portal. 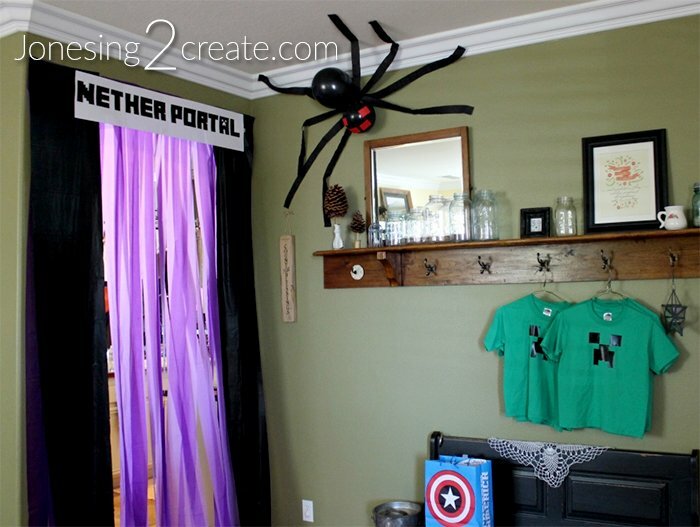 We have a great arch leading from our entryway to our kitchen and I love decorating it for birthday parties. Lots of people hang streamers to make the nether portal, but I have found that it is loads faster to just cut a plastic tablecloth into strips with my rotary cutter, leaving about an inch up at the top uncut. I reinforced it with tape in a few spots and hammered in some sewing pins to hang it up. The sewing pins leave such a small hole that you can’t see the holes in the wall after you remove them and it holds better than tape. 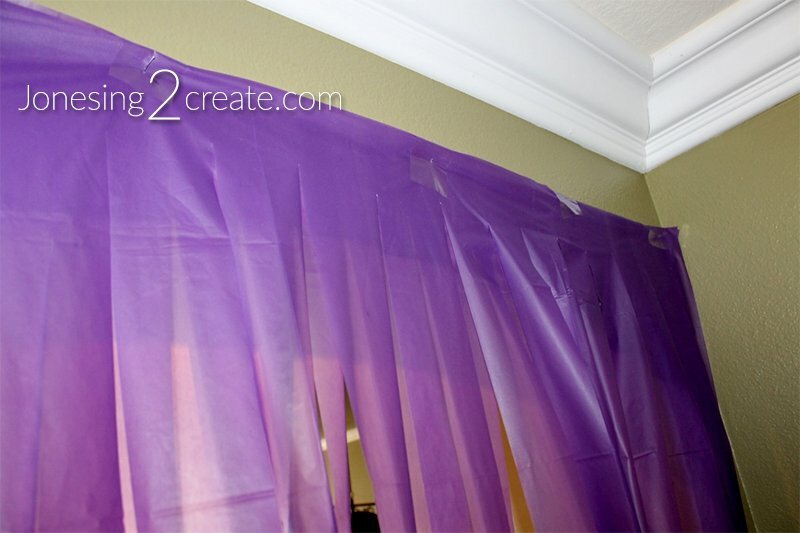 I then cut a black tablecloth in half to make the sides and used two shades of purple to add some dimension. It took about 20 minutes total, including hanging it up. The plastic tablecloths at Dollar Tree are better quality than the ones at the 99 Cent Store, so they work better. The sign was printed on two pieces of paper using the Minecrafter Font at dafont.com. It was a lot faster than making a separate banner for it. Remember, boys usually don’t care about or notice your fancy crafting. 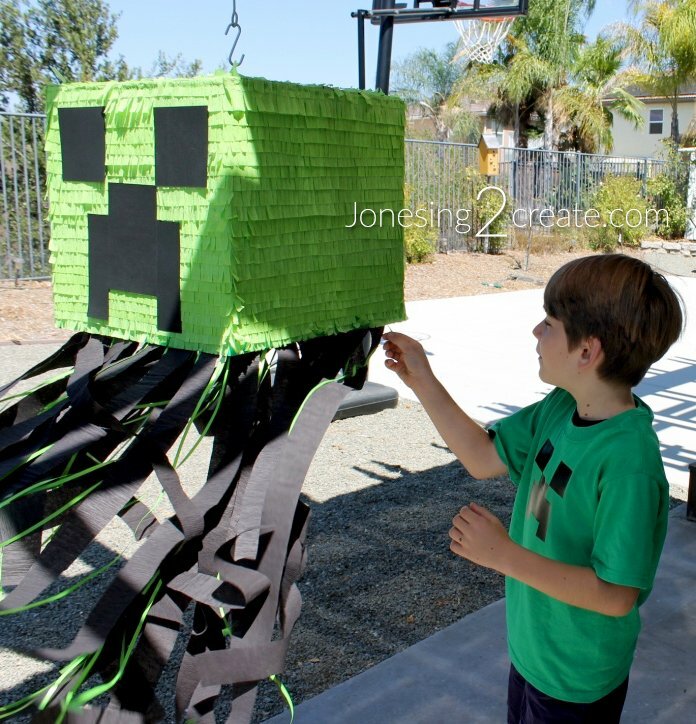 I then added a simple cave spider made out of black balloons and streamers. I tied the two balloons together with string and tacked him up with a sewing pin too so I didn’t have to worry about him falling off. 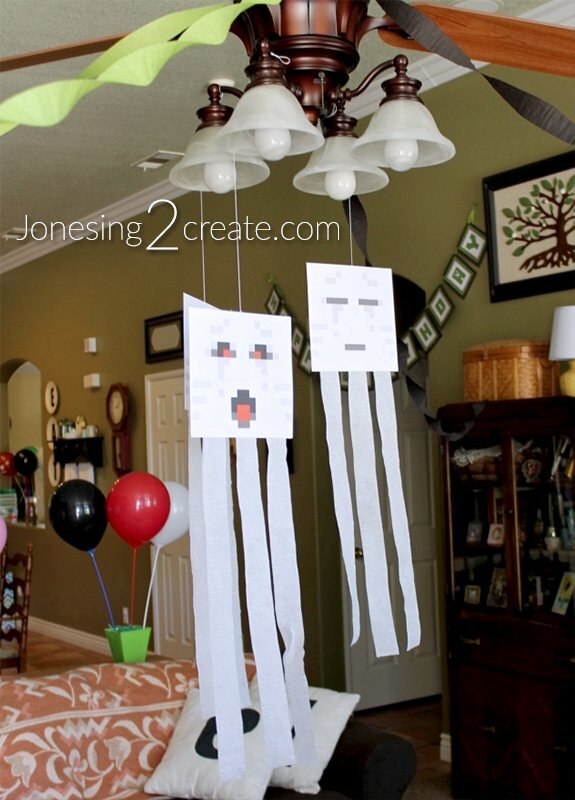 One of my favorite (and easiest) decorations to do were the ghasts. I just printed off the front of the printable ghast masks at fps-x-games.com. I put the sleeping face on one side and the scary face on the other so that it would switch as they floated around. They look great and can also be used in a game as target practice. 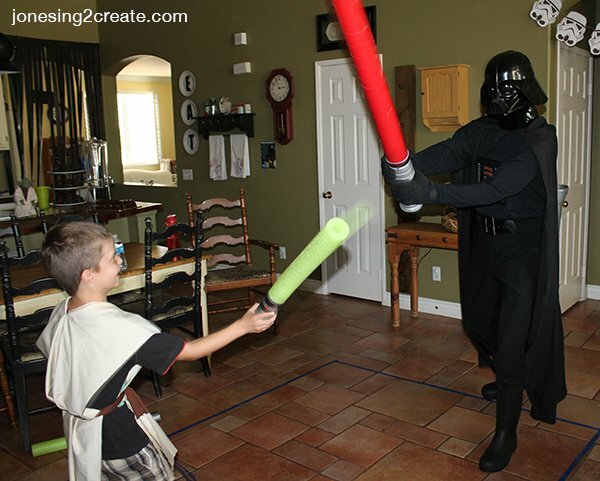 If you are going to invest time in decorations at a boy’s party, the only way they will notice is if they can shoot at it! 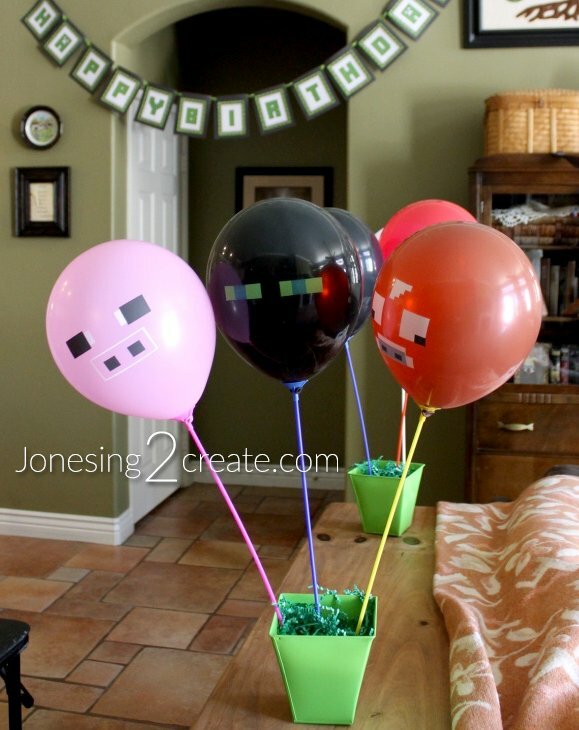 Another one of my favorites were the Minecraft balloons that I bought and stuck on balloon sticks. 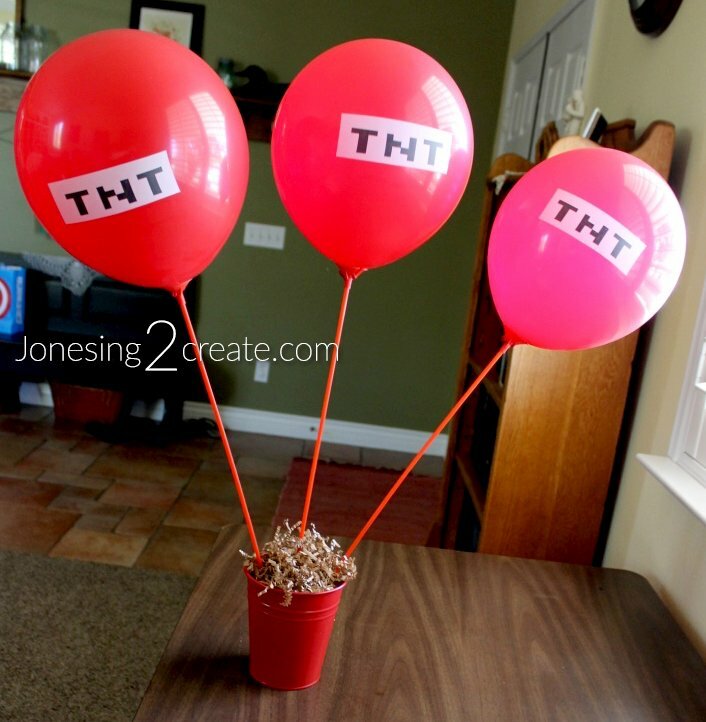 They looked great in balloon arrangements and I let the kids pick one to take home at the end of the party. They took barely any time at all and were a huge hit. They also made the room feel very decorated without a lot of work or money. I think balloon sticks are a new must have at my parties. They are way cheaper than helium and less fuss too. 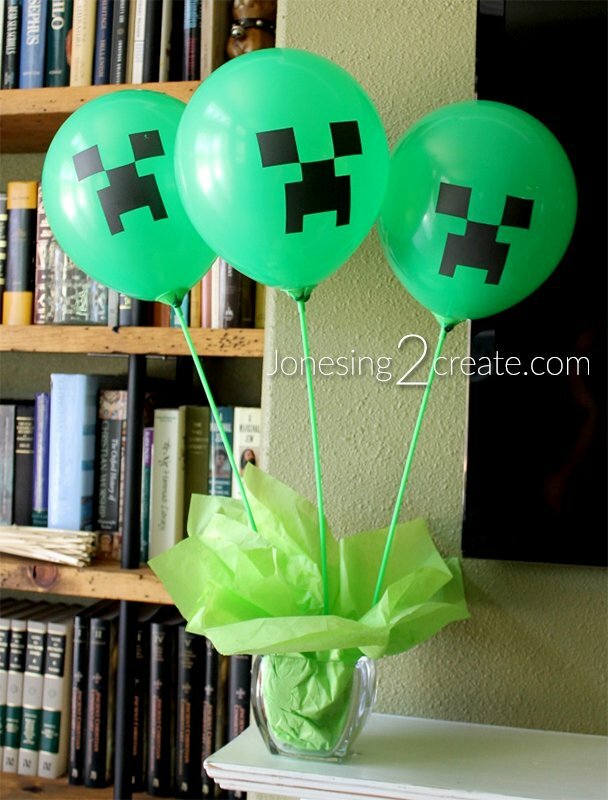 I know a lot of people make their own Minecraft balloons, but time was tight, so I just bought them off Amazon. While I don’t sweat decorations, at our parties we are all about the party favors. 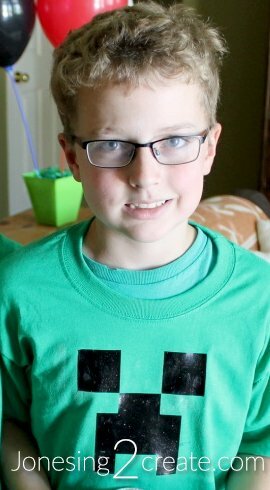 This year besides sending them home with balloons, I also lucked out and found green t-shirts at Dollar Tree. Score! The shirts this year were a big hit. It made me smile when I noticed that one of my boy’s little friends was wearing his t-shirt in every single photo his mom posted on Facebook for about a week. If you want to make your own, I have included a link below to the free download. If you want somebody to make one for you, Alicia over at Zoley Creations is wonderful and has access to all my vinyl files. 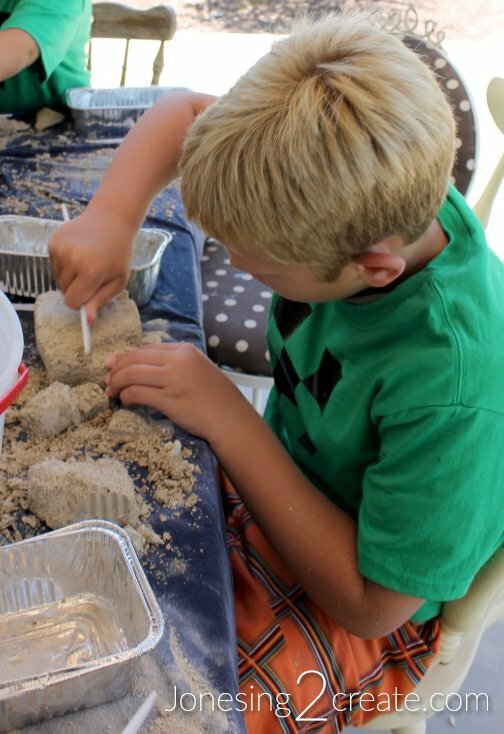 I also sent the boys home with a mining block, a graham cracker house, their cupcake toppers, and pinata goodies, but will talk more about that later. They made out like bandits this year! I thought it would be fun for the kids to do some actual mining, so I made them each a mining block full of gemstones. They are surprisingly easy and cheap to make. This was my husband’s brainchild and it was brilliant. We turned our hallway into a dark and scary mine shaft, and while kids mined around for candy, my husband dressed up as different mob characters and scared them to death. FYI: It takes very little to scare nine-year-old boys. The mine shaft became a kind of rite of passage to manhood at the party and the boys couldn’t stop talking about it. It was super easy to do and I will be posting a full tutorial on it later. 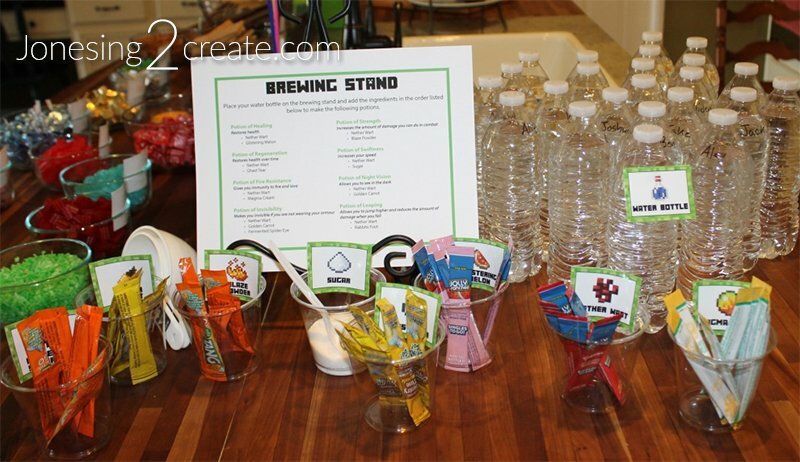 I like to keep food simple and fun for boy birthday parties and try to schedule the party so that it misses meal times altogether. The boys are usually having too much fun to stop and eat. So for this party, we did graham cracker houses and a brewing station. I had very little time to get too fancy this year, so I kept the cupcakes super easy. 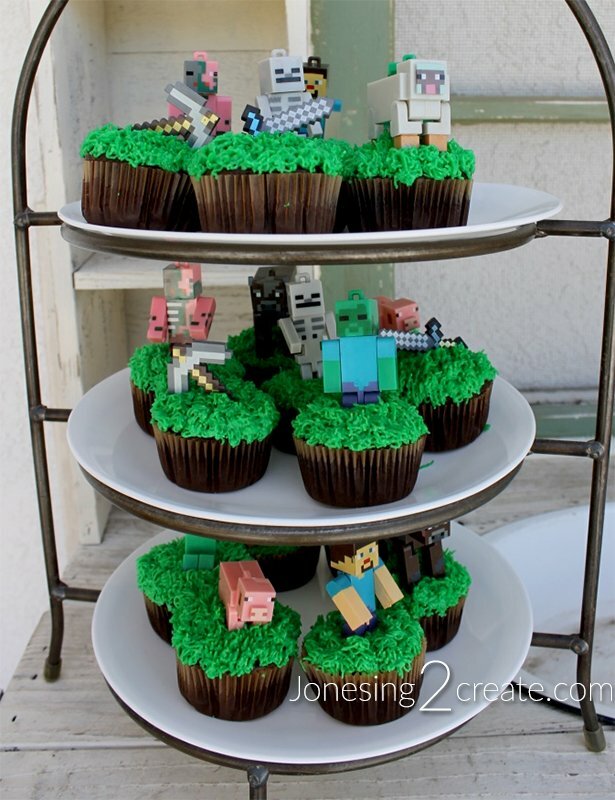 I found some Minecraft hangers for cheap on Amazon and used them as cupcake toppers. They were a great party favor and it made decorating the cupcakes a breeze. 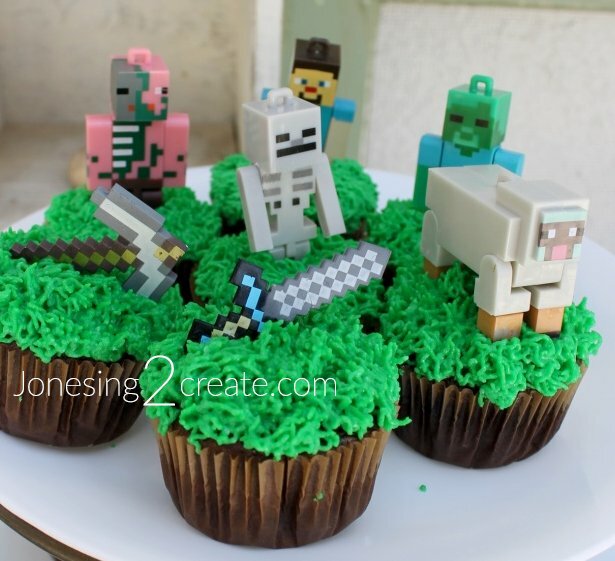 I also got a grass frosting decorating tip to make the cupcakes look more like Minecraft blocks. It was my first time using a grass tip and I am not very coordinated when it comes to frosting, and as you can see they still turned out pretty good. I knew there would be some fighting over who got what topper, so I had the kids draw numbers and they got to pick in that order. It went really smoothly, and I was surprised that there wasn’t any one topper that was in the most demand. 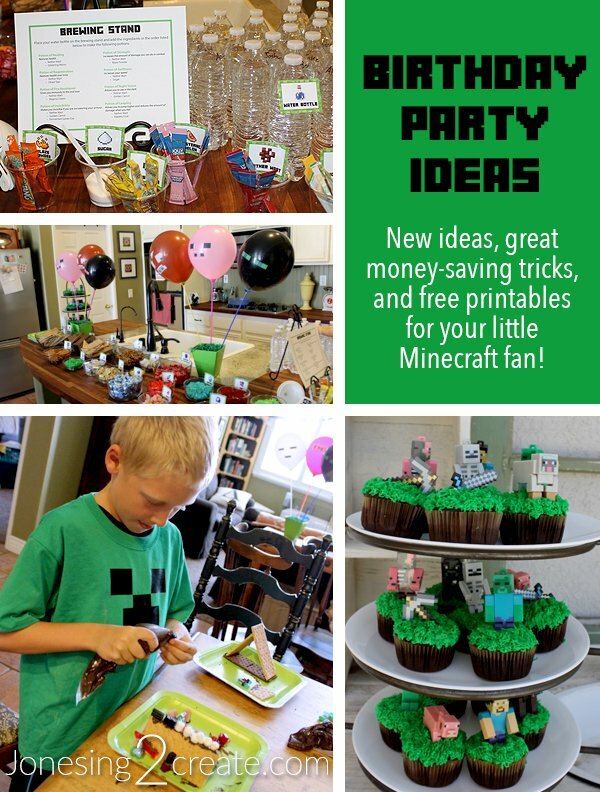 Be sure to follow along and I will be posting individual tutorials on different aspects of the party! You will need a Silhouette to cut the vinyl. They have great tutorials online for how to cut and iron it on. If you want somebody to make one for you, Alicia over at Zoley Creations (https://www.facebook.com/ZoleyCreations/) is wonderful and has access to all my vinyl files.